Due to the over-crowdedness at the beach and for the weather turning out to be quite hot, Vanessa and I decided to hit the tram back home and go for the Stadthafen instead. 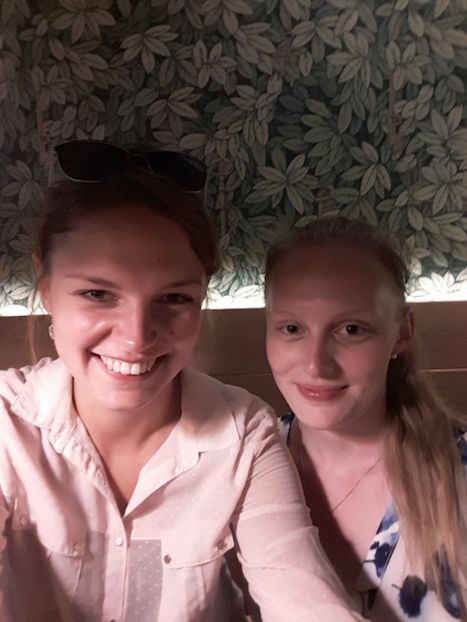 I am aware that there is already at least one entry about the Stadthafen uploaded (check it out here); however, since it was Vanessa’s trip to Rostock, I highly recommend you to keep on following her account. The Stadthafen, for those of you who aren’t familiar with Rostock, is a good place to meet up with friends, have a BBQ, a catchup, and play some Kubb. Since it’s along the Warnow river it also has a nice atmosphere to it, with you looking across the river into the open, wide, green fields and tall trees, leaving the crowded city behind. Apart from spending time with friends, the Stadthafen is also a popular venue to go for a run. And that’s that. All the nice aspects mentioned, Vanessa agrees with the good idea behind it; however, she did point out something pretty negative as well. In Germany we’ve got the saying ‘Sehen und gesehen werden’ which somewhat translates into the situation where you are watching people and they watch you to the extend that everyone tries to impress. And I must admit, she is right. When walking along the harbour, we witnessed all types of people, trying hard to look pretty, the girls generally tending to wear the same clothes, putting a lot of effort into looking effortless and the men sporting their six packs. It kinda feels like walking through a H&M store with a limited stock available, the options being reduced to high-wasted jeans and crop-tops. This feeling can be quite depressing, and it can spoil your nice afternoon walk a bit if you are being easily affected by what people think of you. However, there is not really another place for students etc. to hang out in Rostock without paying money. So the Stadthafen is the spot number one to spend some time with friends. And it really is a nice feeling you have when walking along the harbour side, I just wanted to direct your attention to Vanessa’s experience, for she actually does have a point. Needless to say, I have spent nice BBQs and catch ups with friends at the harbour, and once you are settled down you generally tend to forget about all the others around you. Right, after our afternoon walk along the water front, we made our way into the towns centre and went for some food. We decided on some burgers at Peter Pane, which is a place that has opened its doors not that long ago and has a really nice feeling to it. The interior is pretty cool, with some exceptional woodwork along the ceiling and the impression that plants can be found wherever you are looking at, that make you feel like you’re sitting directly in nature. And the cocktail Vanessa ordered actually contained alcohol this time. 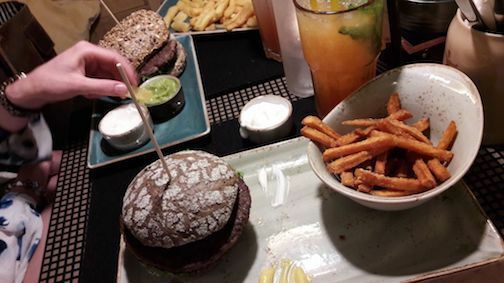 You’ll get some really nice burgers, where you can choose from a variety of bread types, burger patties and sides. My personal favourite are the Maniok crisps, for they are a good alternative to regular crisps and those made from sweet potatoes. To be fair, you generally end up paying 20 € and I would say there are cheaper places you can grab nice burgers, it really is the atmosphere I like to come back for.